Jazzman John Clarke is a beat-style bebop jazz poet, author, performer and recording artist. He is also a published poet with tall-lighthouse in the shape of his debut full collection Ghost on the Road. John collaborates with a variety of musicians & has performed throughout London, Oxford, Edinburgh Fringe Festival (2009), Amsterdam, South of France and in Italy with experimental & improvising musicians. 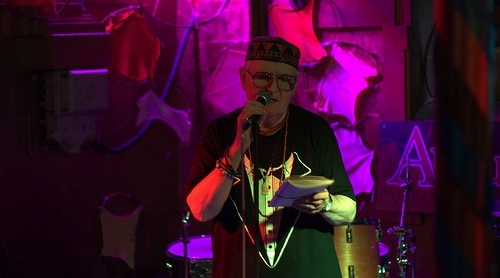 Known for his dynamic and declamatory style John is a popular & sought-after performer on the London scene and has also run a series of alternative events in various parts of London, including Deptford, Greenwich, Lewisham, Camberwell & Shoreditch. His CDs include: Jazz Circus – What Jazz Can Do (For Your Life) and John Clarke – The Way I Like My Jazz. This was one of several wax cylinder recordings made by a group of poets in the studio of Resonance104.4 FM. With thanks to John Page. John Clarke wrote Iniquity especially for the occasion, the two poems were recorded on two cylinders and have been edited together.